Commentary that pivots on a quiet act of co-creation. 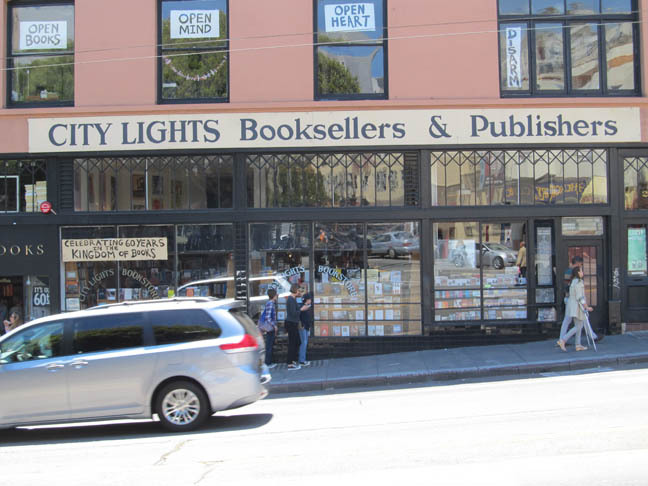 San Francisco’s City Lights Booksellers, a great independent bookstore. These days, an author, especially an unknown author, must—in order to entice any readers to her work who aren’t blood relatives—write endless unpaid blogs, articles and responses for newspapers and magazines and random people creating things in basements. What results is the subsidising of publishers by outsourcing the marketing of the book to the writer, and now and again the subsidising of often giant media corporations, who in times gone by would have had to pay her. There seems to have been a shift from a reading culture to a writing culture, a diminishment of critical space for the contemplation of literature. Writing needs to be discussed and interrogated through reading. If you wish to write well, you need to read well, or at least widely. You certainly need to contemplate reading a book in translation, unlikely to be widely reviewed in newspapers, many of which are too busy wasting space on “how to write” tips and asking about an author’s personal fripperies. It’s a great deal more fulfilling to read and think about a fine book than to attempt to write one. There is something wrong with how much of the media approaches authors and books. They seem to believe we no longer appear to value the labour that it takes to read. That we value most of all the status we imagine will come from publishing a book. Are they right? The only really useful status comes from reading and thinking. Amen, sister. I may waver on my status as a writer, but I’m always proud to be, and to call myself, a reader. In lieu of clarity, she offers a variety of complications. “Place is a story,” she writes, “and stories are geography, and empathy is first of all an act of imagination, a storyteller’s art, and then a way of traveling from here to there.” Or she fuzzes the line between story and the many notions and experiences from which one is made: “Where does a story begin? The fiction is that they do, and end, rather than that the stuff of a story is just a cup of water scooped from the sea and poured back into it.” But is all of this true? I would argue that a story is a made thing — different from place, from lived experience, from abstraction. There are infinite ways of telling a story, but once it has a shape, it does begin. Romm says better and more clearly what I tried to explain in my review and subsequent discussion about the difficulty, at times, of reading this profound but diffuse book, a touchstone for readers and writers. One measure of an interesting book is that it spawns interesting reviews, and this one certainly has. Among many around the web, I especially admired one on the Bay-area radio KQED site by San Francisco writer Ingrid Rojas Contrearas. In a brief column for The New York Times, Verlyn Klinkenborg raises a unique objection about e-books, saying that physical books stay present in the mind, while digital editions vanish, out of sight and out of mind. This may seem like a trivial difference, but that’s not how it feels. Reading is inherently ephemeral, but it feels less so when you’re making your way through a physical book, which persists when you’ve finished it. It is a monument to the activity of reading. It makes this imaginary activity entirely substantial. But the quiddity of e-reading is that it effaces itself. He’s done a lot more e-reading than I, admitting to having read nearly 800 books on his iPad. I can’t help but agree with him, since I’ve bashfully ordered hard copies of books I’ve enjoyed on my Kindle. I was surprised and pleased when I immersed in my first digital book just as deeply as I always had reading hard copies, my only objection before this—somewhat akin to Klinkenborg’s lament—was that e-readers flatten the structure of books. You can’t see section breaks coming at you and can’t ponder at a glance a book’s act structure. 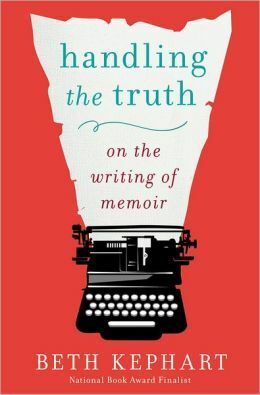 There’s a good short review of O’Brien’s memoir on Southern Bookman. Virginia Woolf once said that novelists write not in sentences but in chapters. Novelistic form is, in some ways, the achievement of this deep, patient rhythm. 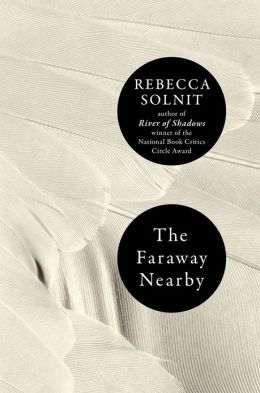 Much contemporary fiction, like much contemporary life, has a restless flamboyance that preempts such wise shapeliness. The Amanda Knox murder case is one I can’t help but knowing something about, though I’ve followed it mostly against my will. In Salon, Tom Dibblee, in a reprint of his Los Angeles Review of Books essay, analyzes the Knox case and the books it has spawned so far, including hers, and finds Knox innocent. He’s a careful reader, and he uses himself effectively in a breathtaking turn at the end. There’s something about Amanda Knox that cuts through logic and taps a more primal lobe of the brain. She provokes intuitive reactions in people. For me, the YouTube video of Knox and Sollecito comforting each other outside 7 Via della Pergola isn’t disconcerting. 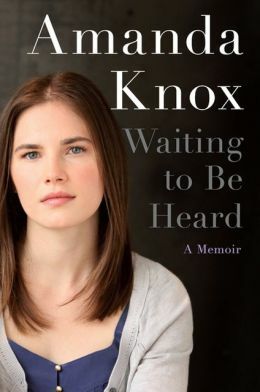 But I can barely make eye contact with Knox’s photo on the cover of her memoir. Her expression comes across as a transparent plea for sympathy, one that looks like feigned pain to mask indignation, feigned girlhood to mask sexuality, even feigned pain to mask true pain. After four years of prison and international pillory, I have no doubt that Knox has suffered. But the photo feels somehow unbearably false. If somebody had just snapped an iPhone shot of her without her knowing it, she’d have been infinitely better off. But in posing, what’s sincere about her has become warped in such a way as to trigger my instinct to distance myself. . . .
What’s compelling to me about Amanda Knox is that it was her slight offness that did her in, the everyday offness to be found on every schoolyard and in every workplace. This is the slight sort of offness that rouses muttered suspicion and gossip, the slight sort of offness that courses through our daily lives and governs who we choose to affiliate ourselves with and who we choose to distance ourselves from. It’s an offness we detect instinctively. This slight sort of offness is a hint that triggers our instinct to go into Darwinian mode and define our pack. For zebras, it’s the slow and feeble who fall behind the harem. For us, it’s the people who behave inappropriately. . . .
[I] t doesn’t surprise me that Amanda Knox is a writer. When she first went to prison, she was certain that if she could just explain herself correctly, her captors would set her free; the problem was not her, but how she expressed herself. And I’m not locked up, but this is why I write, too: to repair the communicative breach that I think stands between me and a freer, better life. Brilliant is an overused word. But, hey, here it fits—Dibblee’s essay exudes it. All students—and I mean all—ought to think seriously about majoring in English. Becoming an English major means pursuing the most important subject of all—being a human being. . . . The English major is, first of all, a reader. She’s got a book pup-tented in front of her nose many hours a day; her Kindle glows softly late into the night. But there are readers and there are readers. There are people who read to anesthetize themselves—they read to induce a vivid, continuous, and risk-free daydream. They read for the same reason that people grab a glass of chardonnay—to put a light buzz on. The English major reads because, as rich as the one life he has may be, one life is not enough. . . .
English majors want the joy of seeing the world through the eyes of people who—let us admit it—are more sensitive, more articulate, shrewder, sharper, more alive than they themselves are. The experience of merging minds and hearts with Proust or James or Austen makes you see that there is more to the world than you had ever imagined. You see that life is bigger, sweeter, more tragic and intense—more alive with meaning than you had thought. . . .
Edmundson’s new book, Why Teach? In Defense of a Real Education, has just been reviewed in The New York Times. My goodness, Richard, you’re all over the place today! What a host of lovely clips from books and essays for us to ponder. 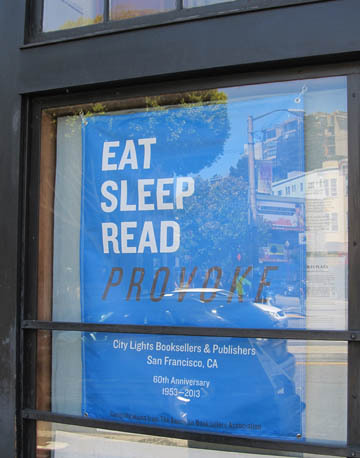 In praise of reading indeed! I’ve just started “Infinite Jest,” and can see that it’s going to be a long-term commitment, because I don’t think the book can be read fast, and not just because it’s such a long book. When I was reading the first few pages, I was muttering and complaining to a friend, “This book is boring! Nothing’s happening. It’s about tennis. There’s no ‘hook’!” Two pages later (yes, I’m the stick-with-it-as-long-as-possible sort), I was entranced, and ready to spend the time to read the whole book. Though virtue is said to be its own reward, that is really more true of reading than of virtue. With reading, you not only get the immediate thrill of the chase of an idea, a theme, the gradual solidification of characters, but you have something to take away with you and think about later, “when in the sessions of sweet silent thought” you “summon up remembrance of things past.” My quoting may not be quite right, but you already know my idea, as is apparent by your post above. (I could equally I suppose have compared reading to the daffodils and said “and oft when on my couch I lie in vacant or in pensive mood [it flashes] upon that inward eye which is the bliss of solitude.”) As you note, it’s not just the immediate experience we get that makes reading so worthwhile, but the residue that remains of your reading experience. All this is just to say “I agree”! Thanks, Victoria—I know you to be a passionate reader, and response is evidence. I have not made it through Infinite Jest yet, and admire your journey. To me, as well, engaging with that book bespeaks being in a good place in your life. I don’t think it’s possible to read such a long, demanding novel unless you have peace of mind. I just counted six blog posts in one. You are amazing, Richard. Or ADD. :-) Thank goodness for your “offness.” It’s what I adore most about you. Try NOT to get arrested. Thank you Richard so much for sharing my essay in The Guardian. The paragraph you highlight is the most important point of the essay. Any chance you could give me a c in my surname as it’s Schofield? 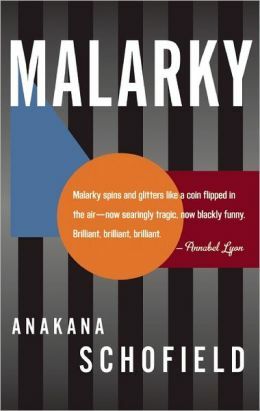 I hope you will read Malarky and find Our Woman engaging. Cheers, AK. Thanks, Anakana! Will fix that C.
This is a remarkable and wonderful blog post. It appears you do all the reading I wish i did; and you are generous and literate enough to share it with others. Many thanks. Thank you. What a kind comment!